Explanation: The Sudbury Neutrino Observatory (SNO) has been detecting so few neutrinos from the Sun that the Standard Model of fundamental particles in the universe may have to be revised. Pictured above is the SNO as it was being built. 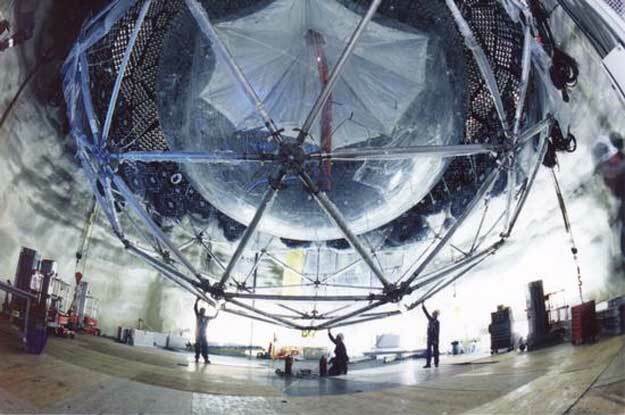 Now operating, this large sphere beneath Canada is detecting nearly invisible particles called neutrinos being emitted from the center of the Sun. SNO appears to be measuring a rate expected for all types of neutrinos combined but a decided deficit for the electron neutrino. The results are being interpreted as bolstering previous evidence that different types of neutrinos are changing into each other. The most popular model for fundamental particles, known as the Standard Model, did not predict such schizophrenic neutrinos. Implications include that neutrinos have mass and therefore comprise some of the dark matter in the universe, although probably not a cosmologically significant amount.